We did it. We opened up our first store to show you that THESE BAGS ARE REAL! Enter your email below and we will send you a SECRET PASSWORD that will give you 10% OFF your purchase at the store. Newsletter Sign Up Send me Password They look like cartoon drawings on your screen. And yep, that’s what they look like in person! So come visit us at the Westfield Santa Anita Mall in Arcadia, CA USA. Right in front of Hollister. Once you get this SECRET PASSWORD, just come up to one of our salespersons when you are ready to check out and tell them the SECRET PASSWORD and they will smile and give you 10% off your purchase…. 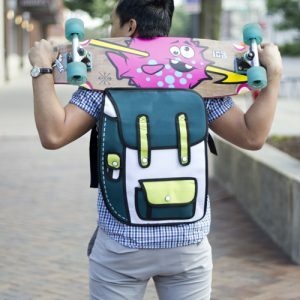 Featured On The Huffington Post’s Top Backpacks for Back to School List! 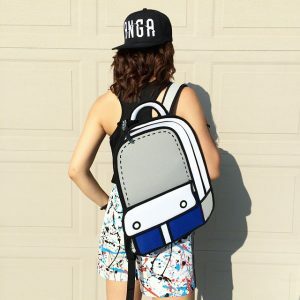 2D Phone Cases and 2D Tablet Cases Brand NEW 2015!